Looking for a easy dinner recipe? I have my best casserole recipes for you to see; you'll have a meal ready in no time. These are the best casserole recipes and they are all made from scratch. Nothing beats a bubbling cheesy homemade casserole - especially with a loaf of homemade bread. Easy to prepare, they can be put together in minutes. Savory, cheesy, and delicious. There is another item to serve with these recipes - tossed salad with my homemade salad dressing. 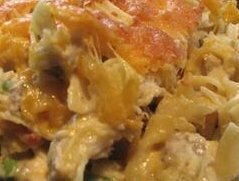 I've got some awesome chicken casserole recipes; they are my favorite. I hope you and your family enjoy them as much as we do. Of course with any of these recipes you can substitute turkey for the chicken. Casseroles are made in one dish and so easy to prepare. 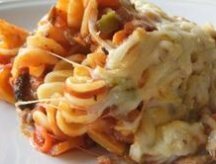 Feel free to bookmark this page, as I will be adding more easy casserole recipes in the future. I love pizza cavatini, and when you take of bite of this masterpiece, you will have to agree. Savory pizza ingredients with melted cheese; can't be beat. My garlic bread recipe is outstanding, and serve with a salad topped with homemade salad dressing. PREHEAT oven to 350 degrees, and lightly spray a casserole dish with vegetable oil. In a skillet, break up the sausage with a spatula and add the onions, green pepper and mushrooms. Sprinkle with garlic and onion powder; sauteing together until sausage is cooked. Add black olives and pasta to the meat sauce and combine. Mix the ricotta with 2 cups of mozzarella cheese and add the egg. Place one half of the casserole in the prepared baking dish and cover with 1/2 of the pepperoni slices and 1/2 of the mozzarella mixture. Spoon the remaining casserole over all and top with the remaining cheese mixture. Add 1 cup mozzarella over cheese mixture, sprinkle with the parmesan cheese and top with the remaining pepperoni slices. Bake for 30 minutes. Cover and let sit for 10 minutes after you bring it out of the oven. Serve with homemade garlic bread, and a salad. At the link below, I listed my favorite homemade dinner recipes - chicken dinner recipes first, and my beef casserole recipes follow.